We’d love your help. Let us know what’s wrong with this preview of Varina by Charles Frazier. With her marriage prospects limited, teenage Varina Howell agrees to wed the much-older widower Jefferson Davis, with whom she expects a life of security as a Mississippi landowner. He instead pursues a career in In his powerful fourth novel, Charles Frazier returns to the time and place of Cold Mountain, vividly bringing to life the chaos and devastation of the Civil War. To ask other readers questions about Varina, please sign up. Did anyone feel that the issue of slavery was somehow diluted with the portraits given in this book? I realize the story is about Varina but is there evidence of her confronting the peculiar institution? My impresson as a northerner was one of looking the otherway to the horrors. Calling her a feminist is a stretch in my mind.....ahead of her time with learning but still uses her female talents. 3.5 Frazier one again returns to the Civil War, with mixed reactions from this reader. I freely admit to not knowing what became of some of the principal players after the Southern defeat in said war, so I can in no way pinpoint accuracies or inaccuracies in this telling. This is narrated from the viewpoint of Varina Davis, fleeing Richmond after Lee's surrender. At her side, her remaining children, a young black boy named James, a black woman, and a few trusted protectors. This was, I felt, the 3.5 Frazier one again returns to the Civil War, with mixed reactions from this reader. I freely admit to not knowing what became of some of the principal players after the Southern defeat in said war, so I can in no way pinpoint accuracies or inaccuracies in this telling. This is narrated from the viewpoint of Varina Davis, fleeing Richmond after Lee's surrender. At her side, her remaining children, a young black boy named James, a black woman, and a few trusted protectors. This was, I felt, the strongest part of the book. The danger they encountered from an almost lawless land, Marauder's, escapes, the Federal soldiers trying to capture them, and those looking for the gold she supposedly carried. We see the damage done to the landscape and the people, some protecting what they have left, and those still trying g to !I've in the shells of their former existence. I found the author did a wonderful job painting this picture of a South in disarray and destruction. While the story is told from Varinas point of view, it is told from the future, when the young black boy, James, now grown, seeks her out to clarify things he had read. Thing being so young at the time he little remembers. It is this interaction with James and a young woman named Laura, that didn't work as well for me. It broke up the narractive, I found it clumsily done and scattered. I think a straight forward narrative would have served this story better,made it stronger, but that is not this book. So while, for the most part I enjoyed the history and a look back at this time, for me I found the changes of focus frustrating. I'm not one to jump on the bandwagon of every new fiction published, but sometimes, if it's an author I've read before, or if I'm certain there will be reviews and interviews and hype, then I like like to get ahead of the crowd and form an opinion based on the book itself, instead of what others think. That happened with this book, as I loved Cold Mountain 20 years ago, and of course, Civil War historical fiction is right up my alley. The library cooperated by getting it to me promptly (I was fi I'm not one to jump on the bandwagon of every new fiction published, but sometimes, if it's an author I've read before, or if I'm certain there will be reviews and interviews and hype, then I like like to get ahead of the crowd and form an opinion based on the book itself, instead of what others think. That happened with this book, as I loved Cold Mountain 20 years ago, and of course, Civil War historical fiction is right up my alley. The library cooperated by getting it to me promptly (I was first on the list), so I'm ahead of the curve on this one. Varina Howell Davis was the wife of Jefferson Davis, the only first lady of the Confederacy, but has always been a footnote in the history of that time. Who cares? Charles Frazier cared, and has created a flesh and blood character who walks with us before, during, and after the war. She was a child bride of seventeen when they married, he more than 20 years her senior. They had six children, of which only one survived her. Well educated by a tutor at her home in Mississippi, she read the ancient classics, could read Greek and some Latin, and could hold her own in conversation of important topics of the day. Her family held no slaves, and her views on the subject were different from others of her class. "Even very young she saw slavery as an ancient practice arising because rich people would rather not do hard work, and also from the tendency of people to clench hard to advantageous passages in the Bible and dismiss the rest". There were a lot of quotable passages in this book, because Frazier's style is slow and considered, meaning that some paragraphs had to be reread, either for the beauty and pleasure contained in them, or to make sure you didn't miss anything.
" Being on the wrong side of history carries consequences. Even if your sin--like dirt farmers in Sherman's path--had been simply to live in the wrong place, you suffered. Those were times that required choosing a side--and then, sooner or later, history asks, which side were you on? " I'm no historian, but I think the author did his homework on this one. It puts you squarely in that time and that world, and inside the mind of Varina Davis, who seemed to be someone I could have been friends with. I also appreciated the framework of the novel, moving back and forth between the past and the present before her death. A solid 4 stars for what this novel afforded me: A chance to get close to someone I'd never even considered before. I'll end this with one more quote from Varina's thoughts. Let me tell you I am"
His name is James, and he stands by the fireplace and waits. When she returns to the lobby of this combination hotel and hospital, he wants to ask her about a book, the names of the children. He knew them, he says. He believes he is the Jimmie in this book. She believes he is playing a game, of sorts. When she finally begins to believe, she sits frozen in her memories for a moment. ”—I hardly know anything about my life then, he says. As Varina, or V, shares the story of her life, moving back and forth through time and place, she shares a childhood spent in Natchez, Mississippi, her marriage to widower Jefferson Davis. He was around 35, she was 17 when they first were married. For their honeymoon, he took her to meet his mother, as none of the groom’s family had attended the wedding, and also to visit the grave of his first wife. Then there are the changes, and moves, that come with his political career. They don’t spend all their time together, she often doesn’t agree with him politically, but it’s all very polite. Varina Davis is the narrator, second wife of Jefferson Davis, the only President of the Confederate States, and she must find safety for herself and her children, including the young boy named James, and a few others. They are traveling through the remains of towns, by homes that have likely been raided multiple times, already. It’s easy to picture this all, the land has been desecrated, an early man-made apocalypse. Those whose shelter remains usable are trying to protect their own and what is theirs, just trying to hold on. It was so easy to picture everything they were seeing, enduring. During this time, I was deeply immersed in this story, living in these pages. The writing throughout is often lovely, but the timeline varied quite a bit, which doesn’t normally bother me. I enjoyed these more in the same manner I would the stories I used to be told by my grandparents, vignettes of another time and place, places, some more lovely or interesting than others. I loved that I was learning about a woman I knew very little about, and she was a fascinating, especially given the place and time. I only wish there had been even more about Varina, more time spent sharing more of her intriguing story, and the story of James. I loved Cold Mountain. But after about 50 pages, I didn't really care about this, and life is too short to force yourself to read things. Early reviews of this book are mixed; but being the enthusiast that I am for Civil War-era fiction and strong female protagonists, I really enjoyed it. That this novel is based on a real person in history makes it doubly interesting (though I would have liked to have known which parts were based on fact and which were fictionalized. Perhaps the final version, unlike the ARC, will reveal some of this information in an Author’s Note). Just Google Varina Davis and Jefferson Davis wedding photo for Early reviews of this book are mixed; but being the enthusiast that I am for Civil War-era fiction and strong female protagonists, I really enjoyed it. That this novel is based on a real person in history makes it doubly interesting (though I would have liked to have known which parts were based on fact and which were fictionalized. Perhaps the final version, unlike the ARC, will reveal some of this information in an Author’s Note). Just Google Varina Davis and Jefferson Davis wedding photo for their actual wedding photo, and you will get a visual description of this woman’s spark. Unlike others, I did not read Cold Mountain (gasp! ), and therefore went into this book with no preconceived notions, expectations, and no comparison-meter (I did watch the Cold Mountain movie and loved it!). This is a story of history, the story of a strong woman – and many women of the time, who were forced to marry young. It’s the story of a woman’s feelings of culpability for her actions and the actions of her husband, president Jefferson Davis, in the face of slavery. It is a story that portrays the behavior of both sides – North and South – in equally horrific ways. And maybe most laudable is that fact that the author could portray a character on the “wrong” side of history in such a sympathetic nature. It is no small feat, and yet Frazier does so with finesse. -	There are no quotation marks, but em dashes, instead, to denote dialogue in some places. Others are written in narrative “he said” or “she said” format, again, without quotes. -	The story is not linear, and in some ways, reads as a series of vignettes of history, jumping around a bit here and there. -	There are A LOT of historical figures mentioned in this book, often at breakneck speed (to some, it may read as a history dump, but I did not interpret it that way. It appears that Varina Davis was simply THAT connected to so many historical figures – a fact I found interesting in itself). All said, I wanted to learn more about this woman we meet in the later years of her life, a stand-offish woman who recounts her past to a weekly visitor: how she grew to be stubborn and direct, what it was like to be the first lady of the Confederate States, what it was like to suffer such hardship, and how one might reconcile such a life as the years pass by. If you enjoy literary fiction, historical fiction, and history, itself, this is a must-read. It is a slow, quiet unraveling of the past, a story to take your time reading. Recommend! If I have a complaint, it's that I wanted more of the weekly visitor - more backstory, more current story, just more. Much more. No rating, although I can't imagine that it would be above a 2 regardless. This was not readable to me. I only got to page 72, life is just too short for me not to find a better read. It jumps and to me there is next to no continuity in the directional lines. Plus I've seen the places she lived and one house for many years in particular- and this just does NOT mesh with her words I read there (clothes of hers I saw too) or her artifacts' history. But it was primarily the forms of the prose used. No rating, although I can't imagine that it would be above a 2 regardless. This was not readable to me. I only got to page 72, life is just too short for me not to find a better read. It jumps and to me there is next to no continuity in the directional lines. Plus I've seen the places she lived and one house for many years in particular- and this just does NOT mesh with her words I read there (clothes of hers I saw too) or her artifacts' history. But it was primarily the forms of the prose used. Just terrible. Scattered- and you need to be a clairvoyant to understand the connections of her thought processes. This book is not for me and is just not worth the work it would take to decipher Varina. Not a book for those who love plot, but a delight for those who love character and strange, beautiful sentences. I have rarely read so slowly just to savor the words. One of my favorite books I’ve read in the last ten years! Varina by Charles Frazier was chosen as a Group Read by members of On the Southern Literary Trail for August, 2018. I have admired the writing of Charles Frazier since his first novel, Cold Mountain received the National Book Award. Each of his successive books have been remarkably good and remarkably different. However, with Varina, Frazier has written his most thoughtful and complex work. Frazier brings to life American society from the Mexican War through the American Civil War and beyond Reconstruction casting his characters with the family of Jefferson Davis, particularly his bride, half his age, Varina Davis née Howell. The daughter of a failed Natchez businessman, Varina is sent to visit the Davis Plantation. She is given no explanation. However, when Congressman Jefferson Davis rides up to the plantation mansion she notes how well he sits his horse and the trim fit of his suit. Marriage follows. The first hint of something amiss is Davis making a visit to his first wife's grave. Varina wonders whether she shares her marriage with a ghost. War is brewing with Mexico. Davis promises not to go to war, lying, having already enlisted. He returns a wounded hero and rises from Congressman to Senator. The heart of the book is set during and after the American Civil War. The brilliance of this novel emerges through Frazier having Varina be his principal narrator, allowing her to emerge from the shadow of history she has previously occupied. He further introduces Jim Limber, a free black child whom Varina took into the Davis home as a foster child. Jim became a constant playmate of the Davis children living in the nursery with them. Varina's portrait of her husband is not a flattering one. He is sombre, lacking humor. Upon the defeat of the Confederacy, he would willingly walk the steps to the gallows to be a martyr to Constitutional principle without regard to the fate of his wife and children. Their marriage is one better practiced by post than presence. Upon the Union Army's capture of Davis and his family in Georgia, Varina requested an old family friend, Union General Rufus Saxton take Jimmie into his care. Years later, Varina is approached by a young adult black male carrying the memoir of Elizabeth Hyde Botume, First Days Amongst the Contrabands, which contains a chapter on Jim Limber. Am I that boy, he wants to know. Do you remember me? Jim serves as a foil to Varina's memories of plantation kindness and her thoughts of slaves as having merely been her friends. He asks her the hard questions. Did you own me? What was I to you? A pet? A toy? The growing relationship between adult Jimmy and the aging Varina provide some of the most moving scenes in this novel. We learn Jim's take away through his thoughts recorded in a notebook of their conversations and Varina's memories prompted by their meetings. “If you mean slaves, you only remember what they allowed you to remember. Even if Davis Bend was really as humane as you believe, they kept their misery to themselves, kept it a mystery to you. I promise that's true. Think of it as a great gift, a mark of affection. Their protection of your memory." So we end where Mary Boykin Chesnut began. We live with the consequences, as Varina did. But we must recognize that Varina was no villainess, but a woman, for all the intelligence and kindness she possessed, lived in a world where she too was a slave to the power of men. This is historical fiction written as it should be. Frazier continues to remain among my favorite contemporary American authors. I recently discovered these Civil War letters in the attic from my relative, Jubal Burnside who fought at Shiloh, Chickamauga, and several other bloody campaigns. I have transcribed them in their entirety for your information and interest. We are now awaiting steamers to transport the troops to Christiana. The division is to garrison for the rest of the summer, a most disgusting prospect, and a fate I hope to escape. The weather is delightful, but very hot and there is the grea I recently discovered these Civil War letters in the attic from my relative, Jubal Burnside who fought at Shiloh, Chickamauga, and several other bloody campaigns. I have transcribed them in their entirety for your information and interest. The weather is delightful, but very hot and there is the greatest abundance of blackberries. Maj. General Walker has the troops reading Varina, by Charles Frazier. Apparently Frazier is a big deal, the Yankees gave him a National Book Award for his previous novel, Cold Mountain. The Bluebellies even made a moving picture of it starring an Australian woman and Renee Zellweger (who is at least from the great state of Texas). However, the boys and I would be happy reading less vexing stories. Maybe a thriller like The Woman in the Plantation, or Dreamy Antebellum Vampire Hunk. Yet, Varina is delightful and noble in it’s own manner. Frazier details the story of our President Jeff Davis’s wife, Varina Davis in the last days of this god-awful Hell. It’s a simple, character-focused story that jumps between the closing days as the South tragically falls, and 1906 where Varina is living in exile. James Blake, once an unwanted black child Varina took in and raised for a spell with her children, has come to speak to her in Saratoga Springs attempting to find out what truly happened during his youth. There are only a few hundred pages, so I feel I shall persevere. I am more than anxious to see you my darling, but still undecided about when I shall come. Look for me when you see me, is as near as I can come to it. I shall take to the pensil to let you know I am well. We have just returned from a trip into E. Tenn where we got big amounts of everything to eat and everything we eat is so good-though not as good as your squirrel dumplings with a side of your special kimchi. I’d give anything to dine with you and father, drinking a gallon of that La Croix Berry sparkling water we’d pick up at Whole Foods. I miss home. I miss everything about it from the farm, the cooling waters of our creek, to Indian leg wrestling grandma in the West parlor. For an 89-year-old amputee with the gout, Grandma could surly flip over the best of us! The shelling of Petersburg has commenced again more vigorously than ever. As we are hunkered down, me and the boys have finished Varina. That Frazier can really write. This simple book has depths deeper than the Mississippi. The way he has drawn Varina is a revelation, she is plucky and real, yet still complacent in this great tragedy that tears apart the country. This duality drives the book-how can one person so grounded, smart, and moral participate in an endeavor so evil. While slow moving, all the boys and myself have really enjoyed Charles Frazier’s Varina. I would recommend it to you and your book club as well as to anyone who enjoys a well-written yarn. It brings joy as the enemy still holds it’s position and our lines are drawn up close. My love to you and father, cousin Sackrider, and of course dear Fannie Licker. Write when you can and a long letter as I am anxious to hear from you. "Being on the wrong side of history carries consequences. V lives that truth every day." Varina Howell Davis, the wife of the Confederate President Jefferson Davis, was a strong woman who faced many challenges in her life. Set in 1906, the elderly Varina talks about her life with James, a multiracial man, on six Sunday afternoons. When James was four years old, Varina rescued the orphaned boy from an abusive situation. She raised him with her children until the Confederacy fell. The family fled s "Being on the wrong side of history carries consequences. V lives that truth every day." Varina Howell Davis, the wife of the Confederate President Jefferson Davis, was a strong woman who faced many challenges in her life. Set in 1906, the elderly Varina talks about her life with James, a multiracial man, on six Sunday afternoons. When James was four years old, Varina rescued the orphaned boy from an abusive situation. She raised him with her children until the Confederacy fell. The family fled southward until they were captured by the Union troops. Varina had a life filled with grief since most of her children died young. She was married to an older man who was still grieving the death of his first wife. She and Jeff only spent about half their married life together since they seemed to get along better when they communicated through letters. Varina lived many years in Europe since she was safer there after the Civil War. She helped support herself with her writing. Varina spent much of her adult life dependent on opium to dull her emotional sorrow. Varina Davis and Julia Grant, the widow of President Grant, became close friends later in life. They both recognized that the North and South needed to heal after the Civil War. I don’t know how accurate the story is compared to history but Frazier convinced me this is the voice of Varina. Something about NC authors and one name female titles seem to always be a great read. I only lack reading one more Frazier book, all are so different than the other. Highly recommend this author and any one of his books. Update: Listened to Frazier speak last night and he’s absolutely charming. He did take liberties because it’s fiction but some material was direct quotes from letters. I don’t know how accurate the story is compared to history but Frazier convinced me this is the voice of Varina. Something about NC authors and one name female titles seem to always be a great read. I only lack reading one more Frazier book, all are so different than the other. Highly recommend this author and any one of his books. One of the hardest wars to understand, for me, is the American Civil War. Perhaps it was unavoidable, but it never seems that way. It is so easy to stand outside of it and condemn the South, but the South was a collection of people, and each one held his own beliefs and motivations and emerged with his own scars, and many were swept up in it by geography, without choosing. I have stood at the grave of Varina Davis, the wife of Jefferson Davis, the President of the Confederate States of America, in Hollywood Cemetery and admit to not giving her more than a passing thought. She was never quoted, or more than mentioned, in Ken Burns’ epic Civil War series and she has been confined to obscurity over the years. Charles Frazier did a marvelous job of lifting her out of that obscurity and giving her flesh again. One forgets sometimes that historical figures were men and women, who ached and suffered and made huge mistakes that they came to rue or lucked into being heroes because they were positioned at just the right place in just the right moment. Another aspect that escapes us is how very young some of these people were. J.E.B. Stuart was 31 when he died. For me, that puts his strutting heroics in an entirely different light. But, I have wandered off subject, it is Varina’s youth that I meant to address. A seventeen year old married to a man twenty years her senior, who did not entirely agree with his position but shared his station. I find it amazing that she ever found a voice of her own. There were parts of this novel that pulled at me and wrapped me up in the narrative and parts where I drifted away. It is written in a unique voice, beginning as a conversation between Varina and James Blake, a black man who had been rescued as a boy by Varina and who spent much of his early years in her home as if one of her children. It progresses from that to a more narrative style, which I admit to liking much better, but then bounces back and forth. Perhaps this is the only way to tell the story as he wishes to, because Varina is looking back and she already knows the lessons she has learned and the price that has been paid. There are moments during the narrative when the genius of Frazier emerges. I felt myself fleeing the burning South and traveling through the devastation that Sherman had left in his wake. One cannot help wondering how anyone managed to survive and rebuild their lives when so little was left intact. Frazier understands his material, and Varina is a three-dimensional character. If you cut her, she bleeds. Having endured the destruction of her world, Varina also sees the slow erosion of her family as well. A mother to six, with only one alive at the time of her own death. I hope the real Varina Davis was as strong and resilient as he has painted her to be, and I hope she felt the remorse as well. then one morning the world resembles the wake of Noah’s flood, stretching unrecognizable to the horizon, and you wonder how you got there. One thing for sure, it wasn’t from a bad throw of the dice or runes or an unfavorable turn of cards. Not luck or chance. Blame falls hard and can’t be dodged by the guilty. He understands life itself, as well, and that much of what we know or feel is in aftermath. How everyone grew up then, one way or the other, whichever side of the skin line you chanced to be born on. Children don’t judge their own lives. Normal for them is what’s laid before them day by day. Judgment comes later. I believe this is so, and couldn’t help wondering myself at what age a child stops taking what comes as what is and starts recognizing the abject injustice of the life he leads, or recognizing the unearned privilege that has been gifted to him. And, all things end up in the past, but a circumstance, such as this war produced, makes the past seem a visible door that is closing in your face. Don’t ever forget me? Don’t leave me? The instant passed so fast, and when that happens, it goes for good and all you have is a slow lifetime to speculate on revisions. Except time flows one way and drags us with it no matter how hard we paddle upstream. Imagine all the memories that you carry with you when you realize you have witnessed evil, perhaps witnessed it for a lifetime, and just turned the other way. The main reason I find history so compelling and so important is that sometimes we have to look the worst headon to keep it from happening again. I’ve never forgotten that girl, and I wouldn’t want to. Remembering doesn’t change anything--it will always have happened. But forgetting won’t erase it either. 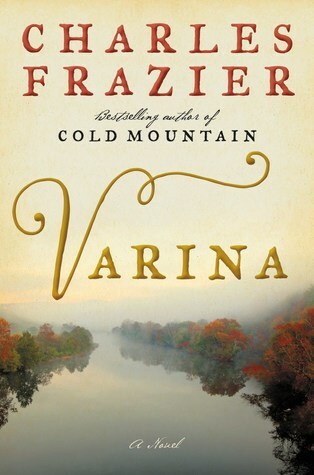 Varina is a beautifully written historical novel by Charles Frazier, author of Cold Mountain. It is the story of Varina Davis, wife of Jefferson Davis, President of the Confederacy, during the American Civil War. The author has a wonderful talent to make the 1860’s live again in landscapes and reverential traditions of the old South. Married at 17 to a man 30 years her senior, Varina’s life was one continuous time of suffering. While married during the Civil War, not only did she witness the bru Varina is a beautifully written historical novel by Charles Frazier, author of Cold Mountain. It is the story of Varina Davis, wife of Jefferson Davis, President of the Confederacy, during the American Civil War. The author has a wonderful talent to make the 1860’s live again in landscapes and reverential traditions of the old South. Married at 17 to a man 30 years her senior, Varina’s life was one continuous time of suffering. While married during the Civil War, not only did she witness the brutality of the War and the downfall of the South, but she lost child after child tragically to disease and accidents. She rescued a black child who was being beaten, his name was Jimmie, and raised him as one of her own. Jimmie was her only child to see adulthood. At the end of the war, vilified by the North AND the South, separated from Jefferson, she fled Richmond, VA, towards Florida. In wagons with her children and a few men for protection, she was pursued by the Northern army and bounty hunters. She was captured and arrested along with her husband who was imprisoned, charged with collaborating with the assassination of Abraham Lincoln and treason. Varina was not jailed like Jefferson, but was under house arrest for some time. Her marriage was tempestuous and she was financially ruined, but she survived because of her ability to stand and face whatever came her way. She was educated and intelligent and It was a losing battle to engage with her in arguments. I loved Cold Mountain, but this effort by the same author frustrated me. It is a fictionalized memoir of Varina Davis, First Lady of the Confederate State of America. The story is told on multiple timelines. One takes place in 1906, when she is reunited with an African-American man whom she had adopted as her own during the Civil War, but from whom she was separated when Richmond fell. Another follows her harrowing experience as a fugitive as the Civil War drew to a brutal close. And, finally, t I loved Cold Mountain, but this effort by the same author frustrated me. It is a fictionalized memoir of Varina Davis, First Lady of the Confederate State of America. The story is told on multiple timelines. One takes place in 1906, when she is reunited with an African-American man whom she had adopted as her own during the Civil War, but from whom she was separated when Richmond fell. Another follows her harrowing experience as a fugitive as the Civil War drew to a brutal close. And, finally, there’s her larger life story: her childhood, the Davis’ courtship, their troubled marriage in the years following secession and war. I understand that this a popular way to tell a story in recent years, but this book contained too many timelines. It was confusing to me. I prefer a chronological story so that it is easier for me to follow the development of a subject’s character & personality. I liked Varina, and I got the sense the she wasn’t a fan of secession or slavery in the first place and deeply regretted the war, but how she came to those beliefs would have been interesting to me and I didn’t get that. Also, just as Christians read the Old Testament through the lens of the New, I read almost everything lately with a great alertness for commentary on our current dire national situation. And, intended or not, Frazier delivered a bit of that, too. His warning to us as we careen towards another Civil War: “Civilization balances always on a keen and precarious point, a showman spinning a fine Spode dinner plate on a long dowel slender as a stem of hay. A puff of breath, a moment’s lost attention, and it’s all gone, crashed to ruination, shards in the dirt. Then mankind retreats to the caves, leaving little behind but obelisks weathering to nubs like broken teeth, dissolving to beach sand.” And this sharp and topical observation: “Never acknowledge that the general culture is often stupid or evil and would vote out God in favor of the devil if he fed them back their hate and fear in a way that made them feel righteous.” Hmmmm. One does not expect to have sympathy for the First Lady of the Confederacy, one does not expect to care one whit for her pain and suffering. Frazier does the impossible. There are few books that I intend to read again in the future, this is one. Jefferson Davis, Varina and their children are buried at Hollywood Cemetery in Richmond. Fun fact--two US presidents are buried there (Monroe and Tyler) and you can have your ashes interred there for $10,000 in President's Circle. It's a very pretty cemetery. Your relations can "visit" you and then go get hot Krispie Kremes! This was a slow book for me. Any book that features a caravan moving by mules that only goes 5-10 miles a day is dragging, and that's how the book went for me. I was also cau Jefferson Davis, Varina and their children are buried at Hollywood Cemetery in Richmond. This was a slow book for me. Any book that features a caravan moving by mules that only goes 5-10 miles a day is dragging, and that's how the book went for me. I was also caught off guard a couple times when Frazier skipped around with narrators and times. This is a mighty fine, fairly traditional piece of historical fiction. The poetic beauty of the language is its strongest element, and there is seldom a page that does not contain something worth slowing down to savor. Frazier's writing is not particularly florid or exotic; he just has a knack for assembling everyday language in a manner that is anything but quotidian. In this book he revisits the American Civil War, territory that served him well twenty years ago when "Cold Mountain" received th This is a mighty fine, fairly traditional piece of historical fiction. The poetic beauty of the language is its strongest element, and there is seldom a page that does not contain something worth slowing down to savor. Frazier's writing is not particularly florid or exotic; he just has a knack for assembling everyday language in a manner that is anything but quotidian. In this book he revisits the American Civil War, territory that served him well twenty years ago when "Cold Mountain" received the National Book Award. This time things are viewed through the lens of the Confederacy's First Family and the political and personal connections which radiated from it. It is refreshing to see the insurrectionist South treated with dignity and compassion without also condoning many of the ignoble principles for which it fought. Jefferson and Varina Davis are shown as very real people: passionate and flawed, gifted and misunderstood, insecure but striving to succeed. They are surrounded by a host of very interesting characters and placed in a variety of unusual circumstances. It makes for an often fascinating read. "Blue sky ahead, black smoke behind...(we) left a black stripe nearly a hundred miles wide...we had orders to enter their houses and steal...cash money, boxes of jewelry, cupboards full of silver forks and spoons. In smaller places, you quit bothering because all you'd find was just pitiful cigar boxes of low-number coins." Moments like these weaken an otherwise well-written book. On the whole, however, the novel moves gracefully from strength to strength. Some reviewers have taken exception to the moderately non-linear narrative but I thought it worked very well and was quite masterfully handled; it's far easier to follow than most meandering storylines. I also think that Frazier should get credit for taking what could have been a seriously boring, traditional Civil War tale and spicing it up with surprising conflict and unpredictable turns. The truth is that he does not spell everything out for the reader, does not make every connection crystal clear, and does not shine a Klieg light on The Big Moments, and I appreciated that. It is especially impressive given that his earlier bestseller has since gone on to become a major motion picture and an opera. The protagonist of Charles Frazier's fourth novel is a remarkable figure, albeit one who has been largely forgotten in the modern historical imagination. For four terrible years, from February 1861-May 1865, Varina Howell Davis was First Lady of the Confederacy. Born into plantation life at Natchez in 1826, Varina's father declared bankruptcy when she was 13, and the family became dependent upon the benefaction of her wealthy maternal relatives. In 1843, Varina was sent to spend a summer at Hurr The protagonist of Charles Frazier's fourth novel is a remarkable figure, albeit one who has been largely forgotten in the modern historical imagination. For four terrible years, from February 1861-May 1865, Varina Howell Davis was First Lady of the Confederacy. Born into plantation life at Natchez in 1826, Varina's father declared bankruptcy when she was 13, and the family became dependent upon the benefaction of her wealthy maternal relatives. In 1843, Varina was sent to spend a summer at Hurricane Plantation, owned by family friend Joseph Davis. There she met Davis's younger brother, Jefferson, an army veteran of the Black Hawk War and aspiring planter who, at 35-years-old, was already a widower (his first wife having died of malaria after just three months of marriage). A courtship quickly commenced and, while their initial engagement was delayed by disruptive family politics, the couple married in 1845 in a ceremony boycotted by every member of the groom's family. The pair honeymooned in New Orleans, where the highlight of their tour was a visit to the grave of Davis's first wife. While Varina was sympathetic to slavery, she was a Unionist at heart (her paternal grandfather had been Governor of New Jersey, and they were Whigs not Democrats). She remarked toward the end of her life that the right side had won the war, and that "God in His wisdom" had seen the North triumph. Educated at a French Huguenot school in Philadelphia, she was bilingual and read Greek and Latin. She excelled in cosmopolitan environs and craved the conversation of other intelligent people, much preferring Washington D.C., New York City, and European capitals to the lethargic Deep South. The southern press detested her for living out her widowed years in NYC, and she caused a minor scandal when she met and shook hands with Booker T. Washington. She befriended Joseph Pulitzer's wife and became an editorialist for the New York World, and she formed a lasting bond with Julia Dent Grant (wife of Ulysses). When Varina died of pneumonia at the Hotel Majestic overlooking Central Park in 1906, it was the Grants' son Frederick who led her cortege. The absurdity of the war now fully exposed, the First Lady of the Confederacy received a military procession attended by Union veterans bearing her casket through the streets of Manhattan toward a ship bound for Virginia. Frazier's novel opens in those final months of Varina's life. She is sought out by a man called James Blake, who is based on the real life Jim Limber Davis. Jim Limber was a biracial boy who became a ward of the Davis family in Richmond under uncertain circumstances. The Davises claimed Varina had seen him being beaten in the streets and brought him home. The gossip mills of that era, obsessed as they were with racial purity, claimed that Jim was a legitimate son and proof positive of the olive-skinned Varina's mulatto ancestry. Jim fled south with Varina and her other children after Union forces captured the Confederate capital in 1865, but he was lost to them after the fugitives were captured at Irwinville, Georgia. Surviving accounts record that Jim was educated briefly in Charleston before being sent north. The Davis family never saw him again, while some romantic historians claimed that Jefferson Davis never stopped searching for his lost adopted son. In Frazier's rendering, Jim and Varina reunite in her final months and over the course of several Sundays she tells him the story of her life. First-person historical novels that mean to recount a figure's entire life always require a starting point, and this is as good a premise as any. But Frazier makes the curious choice of non-linear narration, and each chapter jumps between a series of hazy vignettes with no clear direction. The story begins with Varina's middle years spent in London, and then swerves alternately between her early plantation days, her time in spent in Washington as a senator's wife, her brief period as First Lady, her fated attempt to flee to Havana after the fall of Richmond, her postbellum life at the Beauvoir estate, and her final years as a writer and socialite in NYC. Frazier does an admirable job in particular of evoking the total devastation and despair of the South after Sherman's March. But the cluttered structure of the narrative keeps all the characters at a remote distance, and it feels as though Frazier was able to see his characters quite clearly but he never heard their voices. Varina carries on a lasting correspondence with the fascinating Mary Boykin Chestnut, but the latter is employed merely as an historical totem. The same can be said of Jefferson Davis, Varina's children, and just about every supporting character in the novel. Even Varina, who in Frazier's rendering is a high-functioning morphine addict, speaks in a voice that always sounds somewhat hollow, and even after 300 pages she remains detached and aloof from the reader. This review has been hidden because it contains spoilers. To view it, click here. Varina Davis is witty, intelligent, brave and able to charm those around her. She is also prone to melancholy, which she treats with opiates. Married to Jefferson Davis as a teen, she anticipates life as wife of a Plantation owner, but is instead thrust into Washington politics. As she reminisces of her choice: "At sixteen-other than overwhelming scorn and rage- what do you control? Girls had their bodies and minds. That age, you make choices and don't always know you're making them. Some don't Varina Davis is witty, intelligent, brave and able to charm those around her. She is also prone to melancholy, which she treats with opiates. Married to Jefferson Davis as a teen, she anticipates life as wife of a Plantation owner, but is instead thrust into Washington politics. As she reminisces of her choice: "At sixteen-other than overwhelming scorn and rage- what do you control? Girls had their bodies and minds. That age, you make choices and don't always know you're making them. Some don't matter, but a surprisingly large lot of them haunt forever. Each choice shuts off whole worlds that might have been." Told over seven Sundays, as Varina recalls the past to James, a black school teacher who is seeking clarity to his childhood memories. Her flight south from Richmond following the war gives light to the destruction and horror left after the Civil War. Varina was a complex woman who lived and survived one of the most bleak and tumultuous time of our history. And what was it all for? The answer may lie in this quote: "I've come to see Mr. Davis and his beliefs this way. He did as most politicians do-except more so-corrupt our language and symbols of freedom, pervert our heroes. Because like so many of them, he held no beloved idea or philosophy as tightly as his money purse. Take a king or a president or anybody. Put a heavy sack of gold in one hand and a feather-light declaration about freedom in the other. And then an outlaw sticks a pistol in his face and says give me one or the other. Every time-ten out of ten- he'll hug the sack and throw away the ideals. Because the sack's what's behind the ideals, like the foundation under a building. And that's how freedom and chains and a whipping post can live alongside each other comfortably." Charles Frazier, author of Cold Mountain, has released a new historical fiction about Varina Howell Davis, Jefferson Davis’ wife. The book starts based on the memory of James Blake. As a child in Richmond, James was rescued by V when she saw him being beaten in the streets. Now, James is looking for his rescuer, V, some forty years later, wondering if he will recognize her and she him. They had been separated soon after the Civil War ended. James does not remember his childhood, why he was rescued, and, of course, does not know V’s story after they parted. The story is told as a flashback to James on eight successive Sundays. And V’s life after she and James parted, was very interesting. I had not ever heard of Varina Davis. This book describes her life, her childhood, her meeting of Jefferson Davis, her life with and without him. She is a strong, independent, and interesting woman. The things she did and endured in her life were shocking and startling. The Davises did not have a sound marriage. The book states that out of their 45 year union, they spent about half of it together. Charles Frazier describes her life and events in such beautiful language. Even more than the story itself, the writing style and choice of words, similes and metaphors makes this book. Sometimes I did get confused about what was happening. The story tended to jump around. But I am convinced that I will find much more if I re-read this book, which I plan to do when I can get it from the library again. There are now 37 waiting at the library for this book… so, after that. I have a personal connection to this book as well. I was asked to assist in selecting the cover picture and the type for the title. Given three options for each, the final two used were the ones I selected. No wonder the book is so special to me. This book is about Varina, the second wife of Jefferson Davis when he was appointed President of the Confederacy during the Civil War. The first 60 pages or so are confusing because they are mostly told by "Limber " Jimmie who was a young black boy when Varina rescued and adopted him into her family of 6 children. "Limber " Jimmie as an adult (James) has many questions for Varina and though they have sadly been separated by the war luckily they will meet up again later bringing some answers. So This book is about Varina, the second wife of Jefferson Davis when he was appointed President of the Confederacy during the Civil War. The first 60 pages or so are confusing because they are mostly told by "Limber " Jimmie who was a young black boy when Varina rescued and adopted him into her family of 6 children. "Limber " Jimmie as an adult (James) has many questions for Varina and though they have sadly been separated by the war luckily they will meet up again later bringing some answers. So the true beginning of the story starts in the middle, yet patience pays off because what a story it is. Young Varina is only 17 and twenty years younger than Davis when they marry and she always lives in the shadow of his deceased first wife, Knoxie. For awhile she lives her dream of being hostess in the Presidential Mansion, but as the Confederacy fails and everything she knows is destroyed around her she is forced to flee with her children. With bounties on their heads now all of the characters in her world especially her husband ( from whom she is most of the time separated ) never know who is friend or foe as they try and escape to safety through the destruction. Because I am near my sixth decade of living, I especially devoured the last third of the book as an older and wiser Varina reminisces back on the many lessons she's learned throughout her life. She was a strong educated woman who certainly experienced a perilous life, and one of great loss, and yet still somehow continued to find beauty in small things. Charles Frazier's writing is full of beautiful prose and though this is historical fiction he has done an excellent job of bringing a previously unknown entity to life. Historical fiction set initially in 1906 about the life of Varina Howell Davis, wife of the president of the Confederacy, Jefferson Davis, as told to James Blake aka Jimmie Limber, an African American man she had rescued from a brutal beating when he was very young and has not seen in over forty years. He was taken into her household, included as a playmate with her children, and accompanied her family as they fled Richmond as fugitives on the way to Florida. James, now a teacher, locates Varina Historical fiction set initially in 1906 about the life of Varina Howell Davis, wife of the president of the Confederacy, Jefferson Davis, as told to James Blake aka Jimmie Limber, an African American man she had rescued from a brutal beating when he was very young and has not seen in over forty years. He was taken into her household, included as a playmate with her children, and accompanied her family as they fled Richmond as fugitives on the way to Florida. James, now a teacher, locates Varina in Saratoga, New York, near the end of her life. She had moved to New York at age 60 to make her living as a writer. I looked up Jimmie Limber and he in fact existed and spent time living at the Davis home, as unlikely as that sounds, though he is lost to history after 1865. The author has imagined him as an adult wishing to piece together his past through asking questions of Varina. In this way, the book serves to query the past to attempt to understand it. The timeline jumps forward and backward as Varina recounts her memories to James, which sometimes disrupts the flow, but is in keeping with the nature of memories. Several scenes in this book are particularly memorable, such as the fall of Richmond and Varina's meeting with a farm family in Georgia, and the author employs a florid writing style. The plot simmers but never boils over, and the characterization is centered on Varina. She is shown in a sympathetic light, as an unorthodox educated woman with strong opinions, not always in alignment with her husband, and someone who has grieved the deaths of many of her children. I would have thought she would have been a severe bigot, given her position as first lady of the Confederacy, but Varina is shown in this book as treating everyone with respect, though she never transcends the social structures and racism of the period. The book includes several tense episodes where James calls Varina to task for how she had benefitted from slavery. She grapples with being on the “wrong side of history,” and her role in perpetuating slavery, and ultimately reveals that she believes the right side won the war. In this sense, we find many parallels with current society, as we continue to wrestle with issues that originated from this period (and prior) in American history. The author invites us to learn more about her life by providing a suggested non-fiction reading list. This book is one i'm going to recommend a lot, particularly to readers who enjoy literary historical fiction. Quietly powerful, thoughtful, touching, revelatory. Frazier's portrait of Varina Davis (wife of Confederate President Jefferson Davis) abjures drama -- quite a feat in that the Civil War is the axis on which the novel spins -- and instead looks indirectly at gender, race, marriage, friendship, and other complicated human relationships. And yet Varina's life is indeed filled with drama: h This book is one i'm going to recommend a lot, particularly to readers who enjoy literary historical fiction. Quietly powerful, thoughtful, touching, revelatory. Frazier's portrait of Varina Davis (wife of Confederate President Jefferson Davis) abjures drama -- quite a feat in that the Civil War is the axis on which the novel spins -- and instead looks indirectly at gender, race, marriage, friendship, and other complicated human relationships. And yet Varina's life is indeed filled with drama: her darker complexion elicits mistrust among those she interacts with; her marriage is troubled ( [She] believed she and Jeff could live happily married for decades caring deeply for each other by post, eventually receiving death notices by telegram ); she is altogether too intelligent and independent for her place and time; she experiences terrible loss and sees the awful scars of war; and learns that the world is not quite what she thought it was. If Frazier's heroine sometimes seems a bit too modern for her milieu, it is a minor flaw that I am happy to overlook. Some passages in the book, like this one, just blew me away: Late afternoons she walked down the sand past shiny black devil's purses, washed up jelly fish, sandpipers dashing at the waterline, black-headed gulls standing solemn as deacons, and brown pelicans skimming the water to fill their pouches with little fish. Before sunset, the sky domed soft and blue or flat and gray, and ospreys hovered high, racing still as hummingbirds against the sea breeze and then plunging, wings tucked, into the water for menhaden and spot. She watched the osprey so often and so long she realized they usually shifted the fish in their talons to carry them head first as they flew away. Always the hiss of low bay waves on sand and the shells of horseshoe crabs like empty helmets. There are numerous other passages I might reproduce here, but doing so would not only rob any reader of this review of the joy of discovery, but actually serve as spoilers. Charles Frazier is an award-winning author of American historical fiction. His literary corpus, to date, is comprised of three New York Times best selling novels: Nightwoods (2011), Thirteen Moons (2006), and Cold Mountain (1997) - winner of the National Book Award for Fiction. Librarian Note: There are multiple authors in the goodreads database with this name. more info here.